I know! I know! This post is way too long, but I can’t resist taking you on a trip to Taos and the Four Corners areas of New Mexico. These reminders come from the second book in my BJ Vinson Mystery Series. A lopsided moon daubed wispy tendrils of scattered clouds with pewter. Glittering pinpricks of muted light smeared the Milky Way while moonshine bleached the barren landscape silver. Sharp-edged shadows shrouded the feet of mute, grotesque gargoyles of clay and sandstone: hoodoos masquerading as monumental toadstools, spheroid stones aping gigantic dinosaur eggs, and eroded clay hills with folds like delicate lace drapery. We encountered turbulence as the little plane lifted off from the Double Eagle Airport on the west side of town and headed straight up the Rio Grande. The browns and reds and grays of the desert terrain turned a monotonous dun as we gained altitude, broken only by darker wrinkles of dry washes known as arroyos, the double black ribbons of Interstate-25, and the dull sheen of the river—itself somewhat brown. The Rio is classified as a “dirty river,” meaning it carries high concentrations of silt on its way to the Gulf of Mexico. The green-shrouded slopes of the Jemez Mountains to the west provided a splash of color, as did the Sangre de Cristos to the north. With a maximum range of 470 nautical miles plus a thirty-minute reserve fuel supply, the Cessna would not need to set down before reaching our destination. Taos is a 132-mile trip by car, and at a cruising speed of 129 mph, we would arrive in something under an hour. Feeling a kinship with a soaring eagle, I took in the panorama. “Is that weather off to the west going to cause us any heartburn?” Bright bolts of lightning strobed the black sky on the distant horizon. “You can blame that on the dams,” Jim observed. “When the Rio Grande was declared a wild and scenic river, it flooded regularly. Then they put in all the dams. The way I look at it, they put an end to the flooding all right, but the river and the Bosque are paying the price. They’re both slowly dying.” The Bosque was a two-hundred-mile swath of cottonwood forest lining both banks of the Rio. Above Santa Fe, the water flowing beneath the plane picked up energy, shimmering in the sunlight as it rushed over rocks on its fall from the high country. The farther north we traveled; the wilder the river became. Soon it was white-water rafting country. A few miles below Taos, the true might and determination of the river become apparent as it raced down long boulder gardens to spill out of the black volcanic canyons of the Taos Box. From above, the river appeared to sink, but in reality, the terrain rose on its climb north toward Colorado. Over the eons, gravity and friction and the sheer power of water molecules had carved a deep crevasse through the hard basalt of the Taos Plateau. The Rio Grande Gorge Bridge spanned that spectacular canyon ten miles west-northwest of Taos. We circled over the awesome, 500-foot cantilevered steel and concrete marvel of modern engineering as we lined up for a landing at the town’s small strip. Taos claims a 6,000-year history based on arrowheads, potsherds, and pictographs left by nomadic hunter-gatherers. The town takes its name from the older Taos Pueblo, a massive, multi-storied, pre-history apartment complex of Tiwa-speaking Native Americans. Both the town and the Pueblo are cultural as well as tourist draws. Dozens of Hollywood films, documentaries, and television commercials have been filmed here ever since the 1940s. Jim had radioed the tower well before touching down at the small municipal airport, and Officer Delfino met the plane, as promised. He turned out to be a police officer with more than a touch of the local blood. Standing five-foot-six in his boots with coarse black hair not quite long enough to wear in the traditional bun but shaggier than most lawmen, he projected a calm competence as we shook hands. It would not be wise to provoke this man. His hatchet face wore an air of serious determination, an impression reinforced by his extraordinarily broad shoulders and deep chest. Forewarned by Dix Lee and Lonzo Joe, we hoisted packs stuffed with water bottles, energy bars and a compass. Feeling like I was provisioned for a week in the wilds, I clapped a broad-brimmed floppy hat on my head as protection against the sun and glanced at Aggie. He looked a good deal more comfortable with the situation than I was, but then he would be. He hiked and climbed mountains and conquered deserts more or less as a matter of course. We set off across the rocky ground, following the map Dix had sketched for us. She was supposed to be trailing along behind with someone from the Farmington BLM office. Almost immediately we were swallowed up in a fantastic landscape—not magnificent like the Grand Canyon, but spooky. Weird. Like a moonscape. Mysterious, as if some omnipotent sculptor had capriciously balanced massive, flat sandstone rocks atop slender necks of eroding clay in order to see how long they would stand. We were almost diverted from the gravity of our task by the multi-colored stones, petrified stumps, washes filled with wacky shapes, and the silent menacing hoodoos towering uncertainly over us. In one moment, our surroundings were whimsical; in another, ominous. The Navajo considered this sacred ground, and I could understand why. We trod forbidden territory, or at least that’s the way it felt. There were no footprints in the dry washes or anywhere on the stony ground we traveled, and I felt ours would disappear with our passing, as if we walked an alien planet subject to different natural laws., I glanced behind me to check and took false comfort when I saw my shoe prints still existed. We had barely started our trek, and already sweat was staining my shirt. Following Dix’s hand-sketched map, we plodded on, taking frequent gulps of rapidly warming water, barely able to resist rushing off to explore some fascinating structural gem: thin spires of sandstone rising toward the sky like frozen tongues of flame, piles of mudstone carved by wind and water into ugly, fascinating gargoyles, specks of amber crystal winking in the hot sun, and those endless columns of sculpted, gravity-defying capped rock. Eventually we reached our target, a broad wash holding clusters of flattened, broken round rocks streaked with wind- and water-carved wrinkles. I’d seen color prints of the Cracked Eggs, but the startling reality was greater than the image. The stones did appear to be gigantic dinosaur eggs broken open and abandoned to the elements—dozens and dozens of them. They weren’t, of course, they were merely clay and stone fashioned by that same capricious Hand. In the photos they’d appeared in a dazzling array of color, influenced by the time of day, the intensity of the light, the influence of the clouds. Now, as the sun beat straight down upon us, they were a flat gray with rosy highlights. That should make you want to trade your city shoes for hiking boots, abandon Albuquerque, and explore the Taos and Bisti areas. 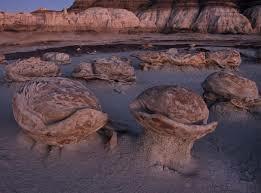 The trip from Albuquerque to Bisti spins time backward from today to the time of the dinosaurs. Think of all that history lying in between! And now my mantra: Keep on reading. Keep on writing. And keep on submitting your work to publishers and agents. You have something to say… so say it.